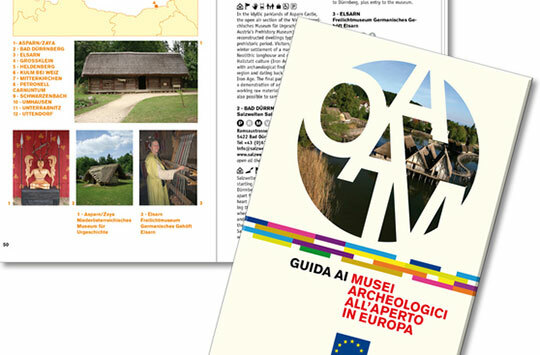 During the liveARCH conference in Modena (March 2009) the Museo Civioco presented the Guide to European Archeological Open-Air Museums, which is a product of the liveARCH project in cooperation with EXARC. This guide, which Modena’s museum has produced for the liveARCH project, is an expression of the desire, shared by all eight of the network’s members, to create the first updated census of the archaeological open-air museums distributed throughout Europe. It can serve both as a compendium of information for experts and professionals, as well as a ready-reference for tourists who have caught the archaeology bug. To achieve our goal, the eight liveARCH partners had to reach a consensus on what criteria should be used in selecting the museums; criteria which, let it be stressed, do not and cannot respond to quality judgements, but are based simply on a series of features that are held to be peculiar to the open-air museum format. Potentially, the open-air museum definition can also include reconstructions that relate to the recent past. However, for the purposes of this guide it was decided to limit our remit to a time span that ranges from Prehistory to the late Middle Ages, periods for which archaeological research methods are normally used. For many of these museums a key factor has doubtless been their relationship with the emergence of experimental archaeology. In such places this developing scientific discipline has found fertile soil for testing its procedures and methods. The scores of boats reconstructed on the basis of archaeologically documented models have not been included in this guide, since they represent a separate category of open-air construction. On the other hand, there is an increasing demand on the part of the public and schools for a form of archaeology-tourism that is more and more directed towards forms of education/entertainment (“edutainment”). Here the learning-by-doing philosophy evinces the visitors’ emotional involvement: they are transported backwards in time, where they breathe the atmosphere of bygone ages. Not infrequently, this process is facilitated by the presence of qualified staff dressed in period costume and expert in historical re-enactment. When Martin Schmidt, Tomas Johansson and me sat together in an almost abandoned station in March 2000 and realised there should be as much as 300 archaeological open-air museums across Europe who all could benefit from contact with colleagues, we did not know what that simple conversation would lead to. The first listings of archaeological open-air museums I made in the late 1990s [when I was still chairman of the Dutch Association of archaeological experiments and education (VAEE)] relied on work by colleagues like Martin Schmidt and for example Claus Ahrens’ publication “Wiederaufgebaute Vorzeit” from 1990. It was published as an appendix in the 2002 small guide by EXARC & the Pfahlbaumuseum Unteruhldingen, later followed by various internet listings. With liveARCH, the ambitions for EXARC grew beyond simply stating “we are there” to representing these museums on the international cultural heritage stage, possibly within ICOM. What lies before you is the result not only of continuously updating the 2002 EXARC list through internet and literature search. By the beginning of the liveARCH project, it was decided to present archaeological open-air museums in a guide and a film. The Museo Civico Etnologico Archeologico di Modena, under the leadership of Dot.ssa Pulini has taken this huge task upon itself presenting the strength of the concept of archaeological open-air museums in a film and its variety “anno 2009” in Europe. Information was collected by contacting the individual museums themselves and by research, followed by contemplation, sieving and structuring. I praise Alessia Pelillo for her perseverance and patience, not just with the museums all across the continent, but as well with the eight liveARCH partners and especially with me, when she received another midnight message saying “I found a new one” - and the whole process had to start from the beginning.